Pat Larter produced audio tapes and films of performance work from the 1960s onwards, sometimes with her husband Richard. In the mid-1970s she started the performance group known as Mahouly Utzon Ragaistic Band. In the 1990s she began painting abstract works and making mixed-media works using low-tech laser prints, photographic transfers, often from magazines, paired with colourful abstracted backgrounds such as in 'Untitled' and 'Pat's anger'. 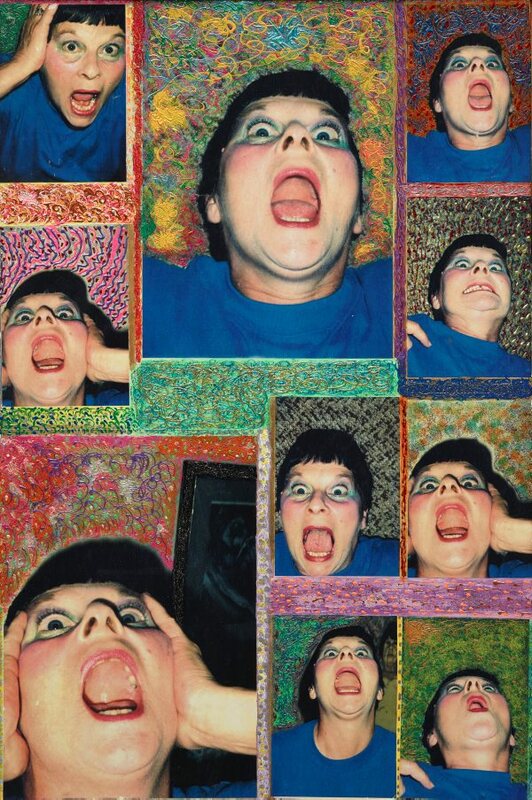 'Pat's anger' consists of a series of portraits of Pat making various faces of surprise or anger directly to camera. Accustomed to seeing such familiar faces in Richard's work, in this work Pat has reclaimed her own image. Signed and dated top c., verso, black marker "Pat Larter 92"